Georges Prêtre: I Ain’t Afraid of No Ghost!! 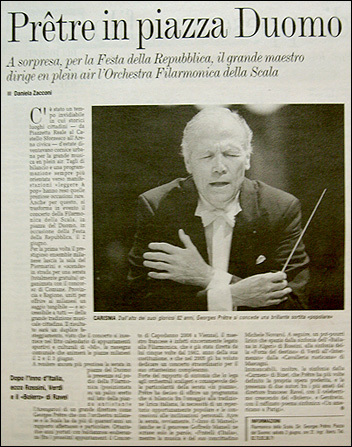 Here's one from the crates: an old article heralding Georges Prêtre's appearance this past January 1, 2008 as his inaugural appearance in the annual Vienna Philharmonic Xmas concert at the Musikverein, where the Neujahrskonzert has been held every year since 1941. What caught our eye in this article was on second glance. omg background??? We had a very ghostly Three Men and a Baby flashback. Dr. Venkman, get a load of this ectoplasmic residue! omg e-haunted by cyberspirits! L@@K!!!!! Aahhhhhhhh! 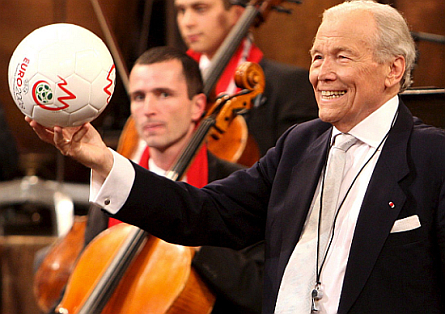 To p1mp a tiny bit this coming summer's European Cup of soccer that takes place in Austria & Switzerland, Maestro Pretre this morning in Vienna toyed a bit with a soccer ball under the worried eyes of a Wiener member (lol). 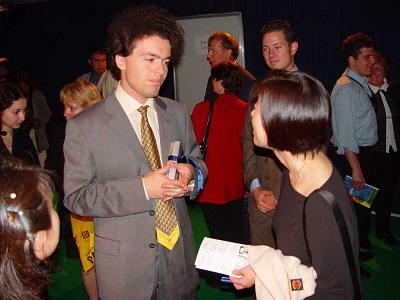 OC's impressions of the Vienna concert telecats are in the post below. 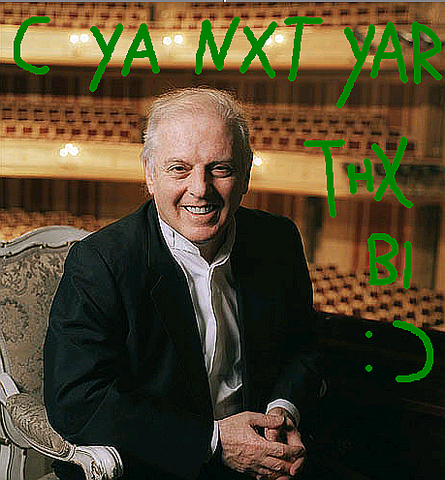 Here we'll just mention that Daniel Barenboim, Maestro Scaligero who has already had to endure three strikes from the Scala orchestra, will conduct next year's Jan 1 concert in Vienna. We're betting the Wiener won't strike. 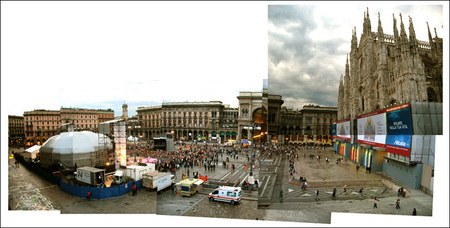 Georges Prêtre and Orchestra Filarmonica della Scala gave the show that was promised last night in the middle of Piazza del Duomo, despite the ensuing rain, the carrying-on of la maratona dello sport (another "non holiday" notte bianca where the city boasts all night parties), and the circling of pesky helicopters. Staging a concerto all’aperto is really tricky business, but the orchestra handled it well...item in gr8 condition A+++ would do bidness again. OC was one of the luckier ones in the VIP section, which meant we were away from the crowds held back by the iron stanchions, sitting sweetly on plastic chairs, sipping free champagne cocktails, getting foot massages from il corpo di ballo della Scala, and Barenboim was on hand to make everyone little balloon animals. ok, well just kidding about those last three details. The front of the stage had been done-up nicely in a green/white/red stripe combo (DONT ASK ME WH?Y), with olive leaves, and white/red carnations. 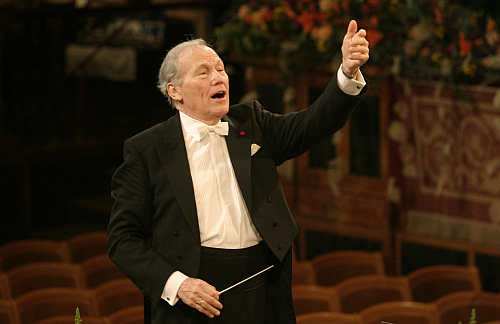 Georges Prêtre led the Filarmonica with his adorable baton jabs, looking like everyone's favorite grandpa. He was all smiles and good times, and the humidity made his hair all fluffy in the back like a little messy lamb. The program began with Fratelli d'Italia, Inno Nazionale Italiano (the Italian National Anthem), and everyone stood at attention. As we sat down, immediately came a thunderous rendition (the orchestra was hooked-up to microphones) of Bizet’s Carmen Overture, followed by: a Mascagni Cavalleria Rusticana intermezzo; Rossini's L'italiana in Algeri overture; a Puccini Manon Lescaut intermezzo; and Verdi's La Forza del Destino overture. It held-off raining until the next work, and began drizzling right in the middle of Gershwin's An American in Paris. By the time Ravel's Boléro had started, it was a harder drizzle, and umbrellas came out and hoods went up. 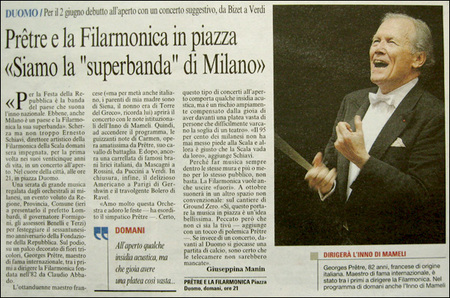 As we reported last week, Maestro Georges Prêtre will lead Orchestra Filarmonica della Scala on Saturday, June 2 (tomorrow night) in a free concert in Milan's Piazza del Duomo at 2100 (omg look @ me im in UREOPE so 9pm=2100). 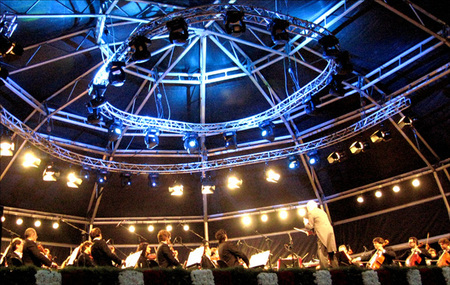 The event is in recognition of la Festa della Repubblica, and is the first time in the twenty-five years of the Filarmonica history that they will play outside. The concert will open with l'Inno di Mameli, the Italian national anthem, then a selection from Bizet's Carmen, then samplings of Mascagni, Rossini, Puccini and Verdi. To close will be Gershwin's "An American in Paris" and Ravel's Boléro. Ernesto Schiavi, the Artistic Director says, "95 percent of the Milanese never have set foot into the theater and now it's only right that La Scala comes to them." ha ha what? what r u talking ab00t? Why don't you come to my house next time so I don’t have to put myself in the middle of Piazza del Duomo with all the drunkards, scammers, and suburban teenagers at 9:00 pm on a Saturday night? kthnxbi! Maestro Georges Prêtre will open the 44° Festival Pianistico Internazionale Arturo Benedetti Michelangeli, next Saturday, April 14, with the Wiener Philharmoniker at Teatro Donizetti di Bergamo (the fine city a 20-min drive from Milan that Juan Diego Florez calls home). 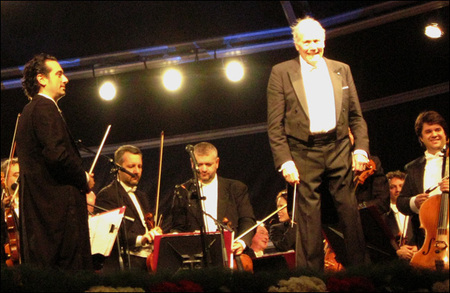 The 83-year-old unsinkable great maestro, who'll conduct the male-only Wieners (heh) the New Year's Day Concert on 1/1/08, will fascinate Bergamo's audience with Brahms 4 and Beethoven 7. A handy .pdf file with the program is here, the Festival's homepage is here. 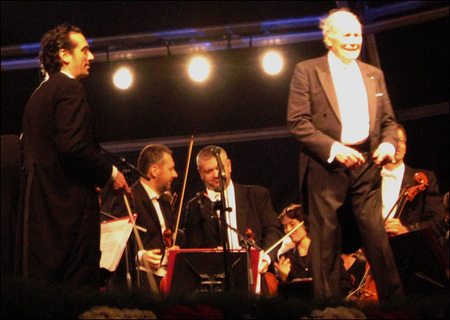 And on May 24, the Benedetti Michelangeli Festival will give the Arturo Benedetti Michelangeli International Award to our friend Evgenij "I Can Play Longer Than Any Of You Decadent Capitalists" Kissin, who'll probably thank them by giving encores all night long, until dawn.